A startup that launched this week is vying to be the next great leap forward for the world of videoconferencing, the promising-but-still-relatively-niche service that lets groups of people in different locations hold Internet-based conversations with each other: Meetings.io, a Y-Combinator alum, has hit the market with just under $1 million in seed funding from (among others) Yuri Milner and SV Angel, and the promise of making a free group video call as easy as clicking on a link, with nothing else required. 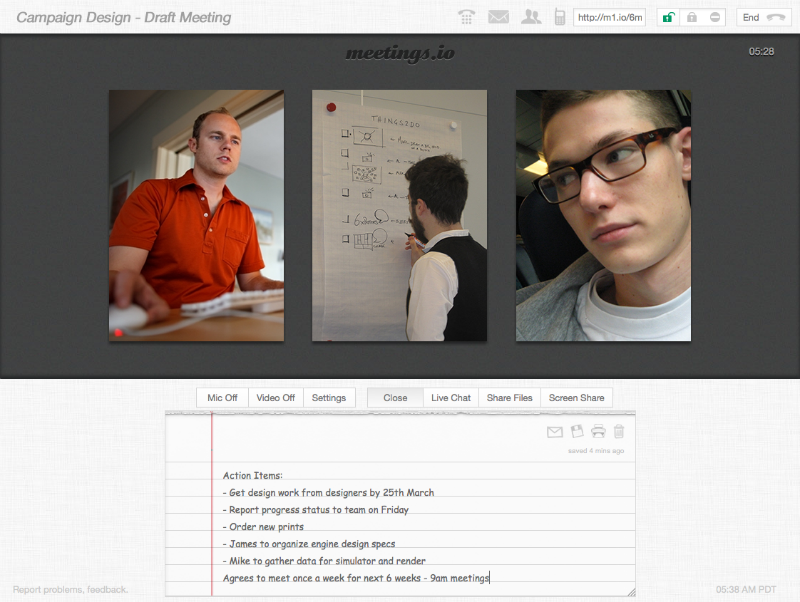 Meetings.io is the latest step in the evolution of videoconferencing services, a classic example of enterprise-focused social networking, which have always held much potential but also frustrations. Starting out as services only for the biggest enterprises that could afford expensive equipment and software, eventually videoconferencing offerings trickled down to Internet-based, mass-market products for anyone (business or consumer) to use with a connected PC or mobile device equipped with a microphone and camera. But even so, they came with a catch: with Skype, GoTo Meetings and WebEx, you need to download software, and pay fees (as you do with Skype to enable more than a one-to-one conversation); with Google, you need to join its social network to use Hangouts. “But you may not want to do that for someone who may be only a short-term contact,” says co-founder Arend Naylor (via a Meetings.io link). And that’s before any and all technical glitches. These are all barriers that Meetings.io is attacking with a very simple, peer-to-peer service aimed not at early adopters and those more technically-minded, but those who need to make a group call for work and without the painful process of setting that up. The aim: “Something lightweight that works without software,” says Naylor. The result: to initiate a call, a registered user simply sends out a link, or invites people to visit a meeting room. With Meetings.io going after a clear hole in the market to make videoconferencing easier, it has attracted some good interest early on. Within the first eight hours of launch, the service signed up 13,000-15,000 users, and hosted 3,000-4,000 meetings — good numbers for a service that didn’t launch with any fanfare and is essentially aiming at enterprise users, not consumers. Among investors, Milner and SV Angel, TechCrunch understands, both doubled down in the seed round. Currently the free service maxes out at five people, but there are plans to raise that number for those who want to pay for a premium offering. Registered users also get their own “meeting rooms” where people can visit to talk, as well as other free services, such as document transfer, notes, live chats and screen shares. Services that the team hopes to add (and potentially charge for) might include extras like SMS, says Naylor. The company is also considering APIs, as well as versions in development that work on iOS and Android devices. Another issue Naylor and co-founder Denis Mars wanted to address was that, in their view, Skype also doesn’t scale well enough to account for short-term and long-term contacts. “It just gets too bloated,” says Naylor. One example of that problem was at Y-Combinator itself. The group now uses Meetings.io to interview candidates and prepare successful teams before their arrival in Mountain View. But before that, YC backers were using Skype.